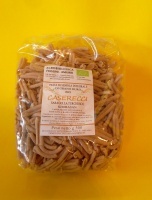 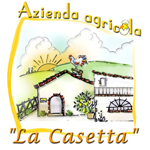 This pasta, produced by a friend of La Casetta Bio few kilometers away, is made with durum wheat flour of the variety Saragolla Turchesco (Khorasan). 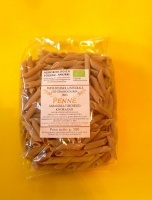 This ancient variety of wheat was introduced in the Abruzzo region in 400 AD. 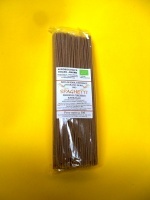 It is an excellent balanced source of carbohydrates and protein, essential fatty acids, vitamins and minerals such as selenium, magnesium, zinc. 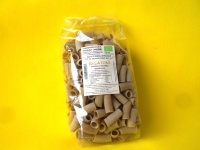 The Saragolla Turchesco wheat, not being to an hybridized corn, has a protein structure more "simple" that makes the pasta more digestible compared to modern durum wheat used by the food industry. 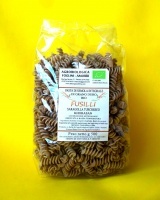 The point of force of this wholemeal wheat pasta Saragolla Turchesco is the flavor; once you've tasted it you will not come back!